Anyhow. I made a few signature dishes and my Moroccan meatballs with couscous was a hit once again. So I immediately chalked one up in my mind to blog you guys the recipe. I got this recipe on the BBC Good Food page a couple of years ago and it’s still one of my all time favorites. This recipe is for 4 people (or for 2 if you want to try it the day after as well). Chop up the onion into tiny pieces, grate the ginger and crush the garlic cloves. Put the minced meat into a big bowl and add the onion, half the garlic, half the ginger, half the spices and season well with pepper and salt. Mix together well with clean hands and form into small meatballs. Heat up your olive oil and brown the meatballs all over in batches in a non stick frying pan. Set them aside. Take out your Staub cooking pot (yes, here he is again!) – add some olive oil and gently fry the rest of the garlic, ginger and spices. It’ll take about 2 minutes. Add the tomatoes, the chicken stock and season well once more. Let it simmer for about 10 minutes. Add the meatballs and let it simmer for at least 20 minutes until the sauce is thickened. If you have the time, let it stand on low heat for much longer than that in order for the flavors to really set. 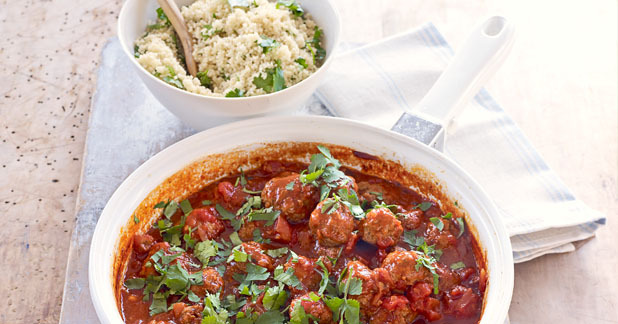 Whilst the meatballs are simmering in the sauce, you can put your couscous into a large bowl. Don’t be scared to use a bowl that can hold 3 or 4 times the couscous that you’re pouring into it. Couscous grows more than double in size when it’s getting ready. Add the butter. Boil the chicken stock, pour over the couscous and cover with clingfilm. Let it set for about 10 minutes. Stir through the coriander and parsley with a fork until the couscous is nice and fluffy. Serve the couscous in a big bowl and the meatballs in your Staub pot. Bon appétit! Also one of my favourit dishes. To add some colour, i pimp up the couscous with pomme granate, dried abricots & roasted almonds.